Encompassing 164,000 square miles, California is only 5 percent urbanized. 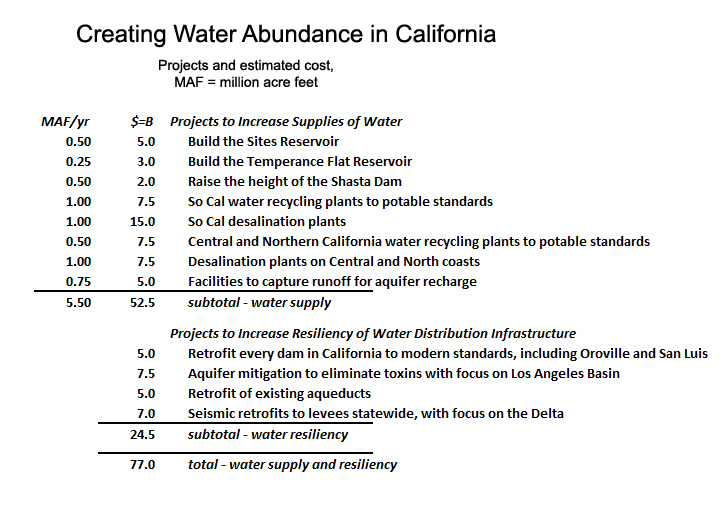 According to the American Farmland Trust, California has 25,000 square miles of grazing land (15 percent), 28,000 square miles of non-irrigated cropland (17 percent), and 14,000 square miles of irrigated cropland (9 percent). The rest, 54 percent, is forest, oak woodland, desert, and other open space. 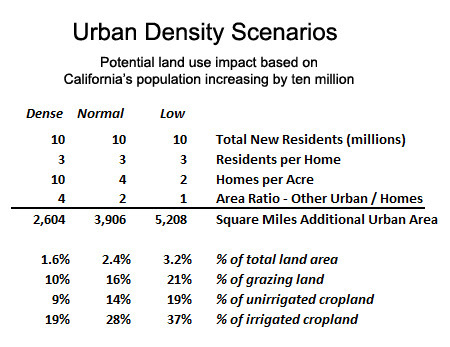 The above chart depicts three urban growth scenarios, all of them assuming California experiences a net population increase of 10 million, and that all new residents on average live three people to a household (the current average in California is 2.96 occupants per household). For each scenario, the additional square miles of urban land are calculated.